The following group activities are open to all residents. Residents may drop in for any session or call the contact person for more information. Click HERE for a chart of gatherings by day of the week. Led by resident Arthur Smith, meets Wednesday afternoons, at 2:00 p.m. in the Smith Study. Contact: Resident Services for information, ext. 7222. This year the group is studying the Gospel of Luke, the Gospel with the birth narrative centered around Mary, the wonderful parables such as The Good Samaritan and the Prodigal Son. Meets every other Monday at 3:30 p.m. Top of the West starting September 24. Contact: Bill Sykes, ext. 3148, bsykes4403@gmail.com or Tony Tambasco, ext. 3114, tambasca@georgetown.edu. This group studies the Lectionary from the preceeding Sunday. Meets 2nd and 4th Tuesdays 11:30 a.m. in the Formal Parlor. Contact: Jean Bacon, ext. 7458, jean.bacon101@gmail.com. Spiritual and reflective discussions based on books read by the group. The book "Forgiveness" by Adam Hamilton is currently being discussed. Meets every other Thursday at 3:30 in the Formal Parlor, beginning September 13. Contact: Bill Sykes, ext. 3148, bsykes4403@gmail.com. 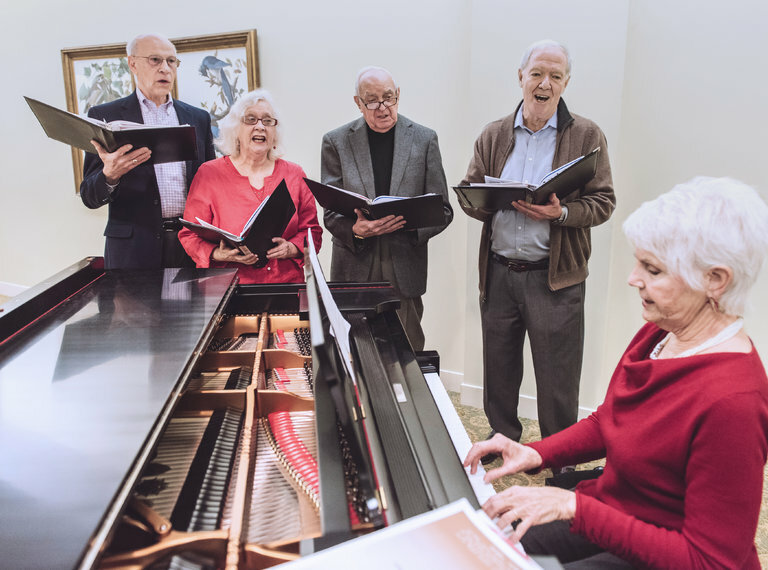 Under the direction of Encore's Executive Director, Jeanne Kelly, The Encore Chorale is open to all who love to rehearse and perform four-part choral music. Rehearsals are Friday at 1:00 p.m. in the Auditorium beginning September 8, 2017 to mid-December and January to mid-May 2018. For ore information on the chorale, go to http://www.encorecreativity.org. For information about the chorale at Goodwin House Contact: Mandy Whalen, ext. 7534, mmw123@comcast.net. Click HERE to read a New York Times article about Encore that features GHBC residents Howard Smith & Tony Tambasco. Residents gather and take turns reading parts in popular plays. Meets every other Wednesday at 1:30 p.m. in the Boardroom. Contact: Howard Smith, ext. 3160, fvnicky@gmail.com. war-torn and disaster areas. 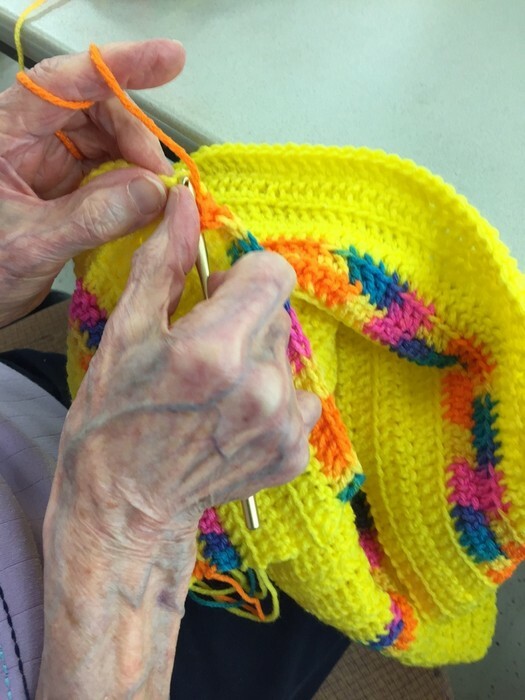 Yarn is donated and instruction available. Meets every Tuesday at 1:30 p.m. in the Art Center. Contact: Peg Lorenz, ext. 7690, peglorenz@gmail.com. Residents write life stories and meet to share their work by reading it aloud. Meets every Monday at 11:00 a.m. in the Smith Study. Contact: George Beshore, ext. 7550 or Sharon Ewing, sharondewing@gmail.com. Video-taped lecture series produced by The Teaching Company. Meets every Wednesday at 3:00 p.m. in the Media Room. Meets Monday and Thursday at 7:00 p.m. in the Card Room. Contact: Sondra Eisen, ext. 7487, Givas@verizon.net. Meets every Friday at 7:15 p.m. in the Card Room. Contact: Kitty Cacciapaglia, ext.7470. Meets every Monday at 7:00 p.m. in the Game Room. Contact: Elaine Moore, ext. 7686, EBMoore@aol.com. Meets Tuesday and Friday at 7:00 p.m. in the Game Room. Contact: Al Goldberg, ext. 7432. Meets Monday at 2:00 p.m. in the Game Room and Thursday at 7:00 p.m. in Top of the West. Contact: Lois Czapiewski, ext. 7562, loisczap@gmail.com. Croquet:Meets Saturday mornings from March through November in the front yard. Others can use sets which are kept in the Rotunda coat closet. Contact: Lois Czapiewski, Ext. 7562, loisczap@gmail.com. Residents take turns leading the discussion of a book selected by group members. Copies of the book are available on loan from the Fairfax County Library. Meets at 10:30 a.m. the second Thursday of the month, in Top of the West. Contact: Helen Lane, ext. 7460, helen.brady@gmail.com. Click HERE below for a list of books to be read this year. Residents meet to share original and/or favorite poetry. Meets the 2nd Thursday at 2:00 p.m. in the Smith Study. Contact: George Beshore, ext. 7550. Many of our programs are led by residents. If you have an idea for a new group that you would like to lead, please contact Cultural Arts and Events Manager, ext. 7221.